The Ladies Gaelic Football Association launched our Strategic Roadmap 2017-2022 in 2018 and a key area of this is to ‘Define a Model to Promote Female Leadership Across the Association’. 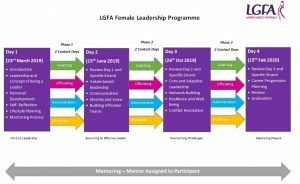 The first step of this was to put a Female Leadership Work group in place and they identified the need for a Female Leadership Programme to be in place as part of an overall Female Leadership Strategy. This programme will take place over a 12 month period with four generic leadership themed days where the full group of 20 participants will be together and then 6 evenings dedicated to their specified strand. These interactive sessions will be delivered by expert leaders in each field and some of the most high profile females in Ireland. When will the Programme take place? There will also be two evenings between each date assigned to your strand. Why Should I apply for the Programme? You will learn to inspire and lead others by better understanding yourself and how you relate to people and situations. 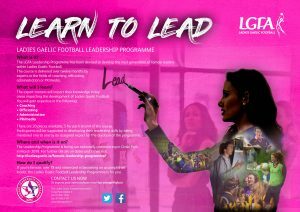 The Female Leadership Programme will develop your personal leadership skills, helping you to achieve your goals and reach your full potential. How Can I Be Part of this Programme? Applications are now open and you can CLICK HERE to complete the application form. Participants must be female, 18+ and demonstrate an interest in progressing in their chosen field. Enquire Now for this Exciting New Programme!